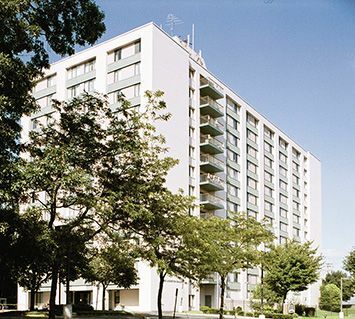 This 12-story, 209 unit senior community offers the enjoyment and freedom that comes with independent living aged 62+. There are a limited number of mobility disabled units available to those who quality over the age of 18. Essex Co-op is nationally recognized as “A Community of Quality” by the National Affordable Housing Management Association. And this unique cooperatively managed building has served the surrounding community of Essex since 1981. Resident members enjoy the peace and privacy of their apartments, but also enjoy participating in the frequent community activities. Come join in on bingo, gardening, card playing, exercise, and even relaxing in our peaceful garden. There are also occasional catered events and many other chances to be a part of a lively community. Effective June 1, 2014, Essex Co-op became a smoke free co-op. Smoking is not permitted on the property, including but not limited to apartments, common areas, patios and parking lot. The designated smoking area will be Eagle Park only. Essex Co-op is centrally located near the Essex senior center, shopping, library and I-95 and I-695. Essex Co-op is affordable for everyone. Every unit has subsidy and resident members pay only 30% of their income for rent. So don’t wait! Join us today! Essex Co-op is proud to be recognized as a NAHMA Communities of Quality Corporate Partner. This designation is for multifamily properties that have achieved a high standard of excellence in the way they are managed, the services they provide residents, the experience and training of personnel, and other criteria.